Setting a new standard in cordless clipping. The Liveryman Black Beauty horse clipper is a great option for anyone with a nervous horse. It's variable cutting speed makes it stand out from other clippers, allowing you to start on a quiet speed of 1500rpm and increase the power and the speed (hence increase the vibrations and noise) as the horse gets more confident. The Black Beauty is fitted with a brushless motor to give exceptionally efficient power. This type of motor also has fewer moving parts which creates less friction, less wear and less heat - which means you need less services and have a cooler running clipper. The UK designed multi vented cutting head also adds to the cool running temperatures. The modern large capacity lithium battery pack gives 3-4 hours clip time and has a fast recharge time of just 4 hours. The Black Beauty mains charger is also a mains adapter so the Black Beauty Cordless Clipper can become a mains clipper at no extra cost. 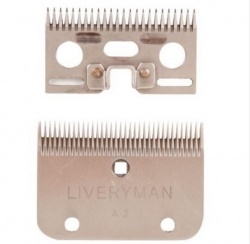 The clipper uses the popular Liveryman A2 blades - one set is included with the clipper. 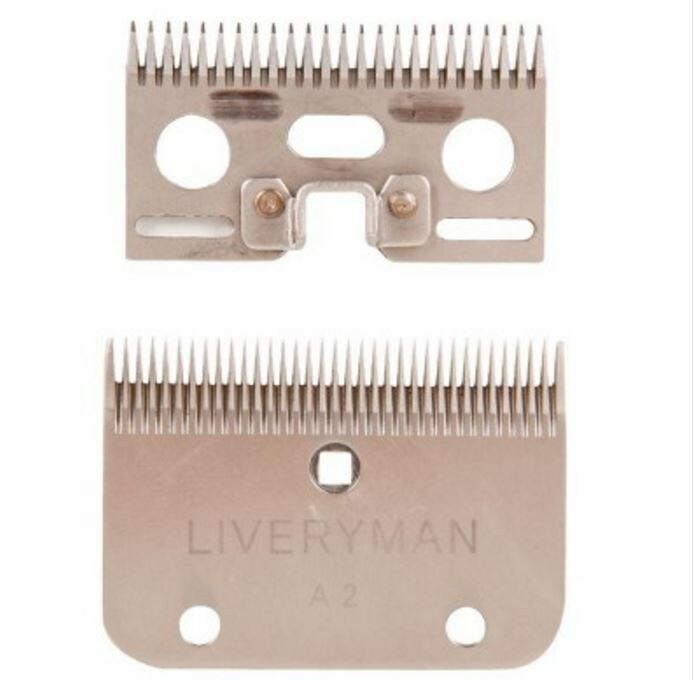 It can also take the Liverymman A22 Fine blades for a shorter hair length. The Black Beauty is ergonomically designed, comfortable to hold and easy to use. Due to the power of the motor, there is no need to run it at full speed all the time. FREE Clipper Suit (blue). This will come in Medium, unless you request Small or Large. These suits are a heavy paper type material and are ideal for allergy sufferers or those wishing to leave the clipping mess at the yard! A small light-weight trimmer, used for the face, ears and hard to reach places that need tidying up. This neat little trimmer can run from the mains or from the rechargeable battery. It weighs 130g and is very quiet with low vibrations. It takes 5 hours to charge and clips for 45 minutes. The Flare has a cutting width of 35mm and leaves 1mm of hair. 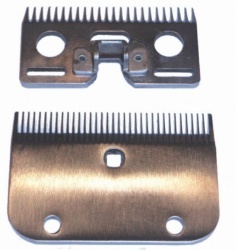 It also comes with attachment combs that will leave 3, 6, 9 and 12mm of hair. It is not as powerful as the larger trimmers, like the Element, Classic and Sierra. However, it is a neat little tool and great for training nervous horses or for quick touch-up jobs. The trimmer comes with a hard case, plastic comb attachments, oil and a brush. It has a 12 month warranty. Need a larger trimmer? 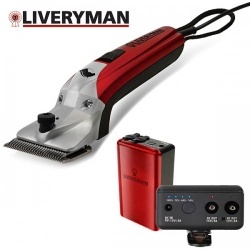 Consider adding the Liveryman Bruno Trimmer, which uses the same battery as the Black Beauty. Add a wide blade and you can even clip a horse with a light coat. Change the blades and you can clip a dog too. The prefect grooming kit! What we say: This is a great clipper and very comfortable to use. 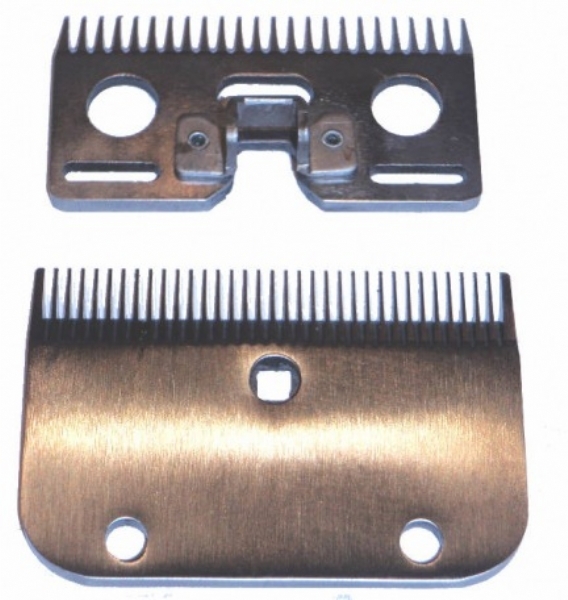 The two speeds set it apart from other clippers and make it a good choice for nervous horses. There are many copies around - but don't be fooled, they do not have the same stringent quality checks!